Charlotte Mason’s teaching methods are widely acclaimed, but you can implement her principles long before your child starts school! 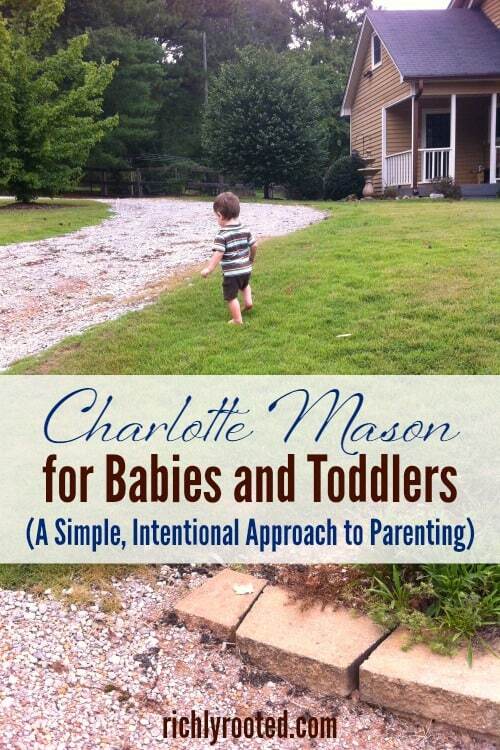 Here’s how to apply Charlotte Mason principles in the baby and toddler years. They say you’re never too old to learn something new; and I say you’re never too young, either! I’ve watched in amazement as my now nearly two-year-old son absorbs his surroundings with a vigour I wasn’t prepared for. I want to guide him in knowledge, even as he grows in stature day by fleeting day. People have asked me how my simple, intentional approach to life translates to parenting, and today you get at least part of the answer: Charlotte Mason. Although there are a plethora of modern-day, cutting-edge parenting gurus to learn from, my chief inspiration is a British educator who lived and wrote over a hundred years ago. Charlotte Mason advocated for educational reforms in her day, and her teaching methods and philosophy have since been adopted by schools and families both in the United Kingdom and in the United States. You might find it odd that I credit Charlotte Mason as my main (non-parental) inspiration, since my son is still far from school aged. But if you’re familiar with Mason you know that her philosophy of education springs from her philosophy of childhood. Mason had a high view of the child as an individual, with often underestimated capacities for learning and appreciating the world around them, even from babyhood. She also put great weight on the parents’ responsibility to guide and nurture their children, which plays out in everything from the education they select for their children, to the food they supply, to the picture books they choose for the nursery. 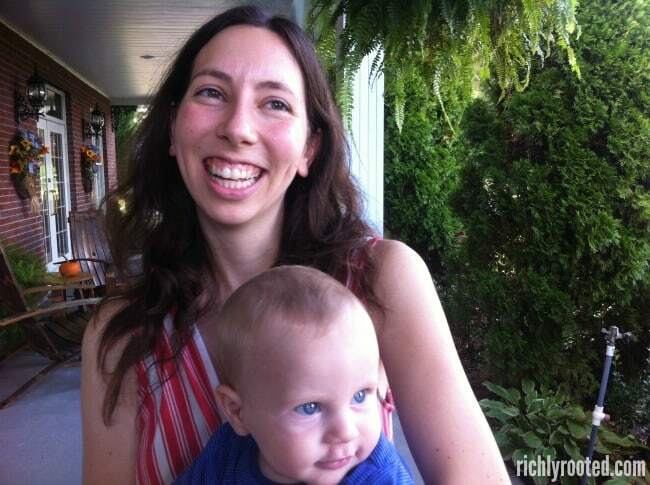 I was attracted to Mason’s brand of intentional parenting when I first browsed her books as a young teenager. As I’ve worked my way through Home Education again this year, I’m even more appreciative of her practical wisdom. Several things stand out to me as key values in a Charlotte Mason style approach to parenting, all of which can be implemented long before your child starts school. Your child’s obedience to you is foundational for their future education–and really, for their entire upbringing. If they do not obey you, how can you teach them anything? Every training you give them will be a battle if there is no baseline of obedience. Regardless of what disciplinary methods you choose to use, begin them (even if in a modified form) when your child is young. Be consistent in discipline and in requiring obedience. Training Little Dude in obedience is one of the hardest things for me as a parent, because there’s no wiggle room for me to be lazy or to talk myself out of it (both of which I tend to do!). But I’ve noticed that the hard work does pay off, and in the long run gives us a more peaceful home. Mason laments the poor quality of many of the educational and entertainment materials available to children in her day. I’m afraid not much has changed! But there are good options, if you take time to bring them into your home. One of Little Dude’s Christmas presents this year was a gorgeous edition of A Child’s Garden of Verses by Robert Louis Steveson. He’s captivated by Tasha Tudor’s detailed illustrations, and it’s evident that he enjoys listening to the rhythms of the poems–he already has his favourites! Besides emphasizing quality in your child’s books and toys, you can encourage their sense of order by showing them how to put back their toys properly (and that every toy has a place). Teach them rituals and habits like washing hands before a meal or doing simple chores. In every habit that you teach them, teach them to be thorough and detailed. Resist the urge to let your child take shortcuts, and resist the urge to do everything for them. Charlotte Mason believed that lots of time spent outdoors will help a child’s imagination, curiosity, and confidence to blossom. She pressed for children (and their parents!) to be outside as much as possible. Your child can learn to love nature long before they can walk! When Little Dude was a newborn, I carried him in my arms and walked my parents’ property every day. In the early days he usually just slept while I watched the play of leaf and cloud shadows over his sweet little face, and breathed the air in deeply myself. As he got older and more alert I let him experience his surroundings by helping his feet to touch the soft moss or brushing a flower petal against his hand. When he learned to crawl and walk I let him explore freely, testing his limits and more or less choosing where he wanted to go. 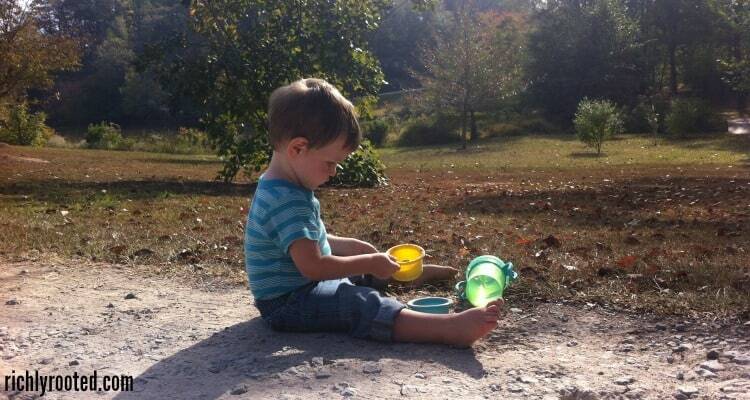 There is beautiful wonder in store for both of you if you take your child outdoors. Enjoy a picnic together, use the opportunity to teach him new words, or simply let him entertain himself while you read a book or journal. You’ll probably find that he’s less fussy when he’s inside and sleeps better at night after a day with plenty of fresh air. Mason encourages parents to give their children lots of free reign to explore and learn, but also take opportunities to direct their attention and teach them in the moment. For instance, during your outside time your child might roam around, but when they come back to you as “home base” you can take a minute to point out the billowy clouds that are hanging above you in the sky. Mason recommends being specific, but keeping your explanations short and not overwhelming your child with these teaching moments. Give them a starting point and they’ll begin to observe more closely of their own accord. As I pour over Charlotte Mason’s writings, I’m continually reminded that if we want to be intentional about parenting our children we need to be authentic. How can we expect them to flourish in all of these noble things if we’re not intentional about developing them in ourselves? If you want your children to learn about nature, you must know it yourself. If you want them to be careful and detailed, you need to model that behaviour yourself. If you want them to love beauty, they should see you appreciating it, too. Cultivate your mind, interests, and habits. You aren’t too old to change, and you can bet your children are never too young to learn from your example. Have you ever heard of Charlotte Mason? How do you seek to be intentional in your parenting? P.S. There is a lot of good information online about Charlotte Mason’s teaching methods, but I encourage you to read her own words, if at all possible. The language in her books will sometimes remind you of a Victorian novel, but they are well worth a read. You can occasionally find copies of the books on Amazon, but you can always read the text online in a pinch! This post was fascinating. I had never heard of Charlotte Mason before but I think I’m going to do some research! It can be so hard to be intentional with parenting ( I struggle with some laziness as well) but the reward is worth it. Making special time for each of my children to help mold them into their best self is very important in our home. Mason is well worth a read! It will be a good use of time. I’ve never heard of Mason’s teachings either. I gravitate to simple living. This would’ve been great to have when my oldest was born! #1 is so very important (and so hard sometimes)! I have nothing to compare it to, but parenting #1 does seem hard to me, too! I feel like I am growing and learning habits and disciplines just as much as my boy is! I home schooled 4 using Charlotte Mason and Montessori methods. C. Mason would be appalled at the amount of twaddle in today’s society! Enjoy the journey. Indeed she would! I kept thinking that as I read her book! Thank you! It’s an ongoing challenge, isn’t it? But so good for us! I loved your post! I am seeing more and more of Charlotte Mason’s original words and I’m so happy that Simply Charlotte Mason re-published her books. I can’t wait to buy them and read for myself!! Thank you so much, Prescilla! I, too, am glad that Charlotte Mason is making a well-deserved comeback!